EarlyAct FirstKnight® (also known as EAFK) is a proprietary program, including all associated names, logos, trademarks, curriculum materials, inventions, discoveries, developments, innovations and business processes, which are the exclusively-owned intellectual property of The Randall Parr Organization, Inc., DBA The Knights of The Guild (Developer). Limited license to use EAFK is extended exclusively by the Developer to our clients and may be revoked by the Developer at any time, for any reason. Licensees may only utilize the EAFK program in strict accordance with the prescribed operational guidelines and intents of the Developer as set forth in the latest edition of the "EAFK Handbook", which is freely accessible online at www.eafk.org. Any deviation from our business processes; unauthorized copying of our material; or utilizing any of the intellectual property that comprises the EAFK program without the express written consent of the Developer is prohibited by law. What does EAFK look like? After faculty and Rotarian sponsors are trained, EAFK easily integrates into any school program with a spectacular annual kickoff event, followed by a ten-minute daily curriculum instruction and six knighting ceremonies per year. This is supplemented by a Rotarian-supervised student service club. Why does EAFK have a cost? EAFK has a cost because it is a proprietary enterprise of an independent enterprise that has employees and ongoing operating expenses. The price of EAFK to clients breaks down to approximately $7-$13 per student, per year, which is minor when compared to other character education programs on the market today that offer a fraction of EAFK's benefits at a many times the price. When needed, we also supplement costs for disadvantaged schools until we can find sponsors for them. We have never turned away a school for their inability to pay. What are the general roles and responsibilities of Rotarians, Schools, and Knights of The Guild in an EAFK program? - Rotarians are to support EAFK at the campuses they sponsor; help set up and facilitate a student service club on campus; participate in all EAFK events and knighting ceremonies; attend and provide guidance at bimonthly, 30-minute student service club meetings; stay in contact with their school and EAFK staff throughout the year; promote EAFK within their Rotary Club/District; and plan for future sustainability. Total Rotarian/sponsor time investment is about 4-7 hours per month, per campus. EAFK staff will provide training for sponsoring Rotary Clubs. - Schools are to teach our curriculum to all students daily; host one student orienation annually; host six knighting ceremonies annually (at least four for middle schools); invite parental involvement; prioritize and promote EAFK on campus; and work with Rotarians to set up and guide the student service club. All EAFK components are integrated and must be used in conjunction with each other. While certain flexibility is allowed, schools are generally required to conduct the EAFK program as directed for maximum results. - Knights of The Guild are to coordinate all EAFK events and knight appearances; facilitate ordering of student awards; manage curriculum content and online presence; conduct research and development; provide daily support for sponsors and schools; produce all live-action shows; protect EAFK program quality and integrity; and support EAFK fundraising events held by our sponsors and schools. Is EAFK an official program of Rotary International? No, EAFK is a Rotary Project. We should also not be confused with "EarlyAct", which is a free, elective service club for students. Can an EAFK program be revoked? Yes. 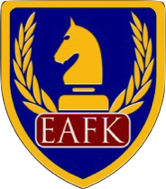 Every sponsor and school within the EAFK network is licensed to utilize the program by The Knights of The Guild. If problems should arise, such as deviation from our campus operational guidelines, then we will assess the situation and offer ample opportunity for correction. If the problems persist, then we reserve the right to cancel the license and pull the program. Can a school cancel a previously scheduled knighting ceremony or other EAFK event? Sometimes, but due to our scheduling process, no refunds can be allowed if an alternate date for rescheduling is unavailable or we have contracted professional stunt performers for an event. Yes, EAFK is highly effective if it is used as directed. Each school faculty must be trained every 1-2 years; they must have an annual Student Orientation for all students; the curriculum must be taught daily to all students; six knighting ceremonies (for elementary) and four (for middle schools) must be conducted annually; no more or less than 1/3 of the student body should be chosen to receive award medallions at these ceremonies; and, a Rotarian-guided student service club must plan two service projects annually for the campus to participate in. In What Rotary Districts Can EAFK Programs Be Found? EAFK programs are currently being sponsored in Rotary Districts 5840, 5870, 5890, 5910, 5810, 5930, 7750, and 7680. Can a Rotary Club desiring to sponsor an EAFK program apply for a Rotary Grant to help pay for the program? Is EAFK protected by copyright?